L = 67.4 mm, W = 58.3 mm, Ht = 22 mm [RTS 22/3/2004]. Purchased by Patti Langton for 50 piastres on 25th February 1979 as part of the British Institute in Eastern Africa's Expedition to the Southern Sudan [RTS 14/5/2004]. 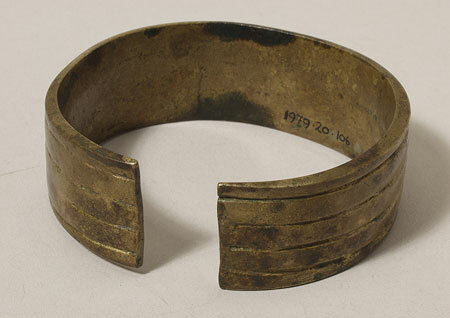 Penannular bracelet made of a narrow piece of brass, rectangular in section, that has been bent into an oval loop with open ends, 14 mm apart. This is flat on both inner and outer faces. The inner face was originally decorated with at least three parallel grooves around the circumference, probably of an original four grooves, but these have largely been worn away - confirming the collector's comments that the particular example was said to have been over three generations old. The outer face is also decorated with four parallel grooves; these have also been worn smooth in some areas. Complete and intact; the surface is cracked down the outer face, and there are several patches of discolouration over the surface, although elsewhere the metal is still strongly brass coloured (Pantone 871C). Length across bracelet exterior 67.4 mm, length across bracelet interior 61 mm, width across bracelet 58.3 mm, thickness of metal 1.5 mm, height 22 mm and weight 95.7 grams. Purchased by Patti Langton on 25th February 1979 for £50 piastres, as part of the British Institute in East Africa's expedition to the southern Sudan. The place of collection was not specified, but would have been either Dhangrial, Wun Rog or Mayen, all of which like in the modern administrative district of Northern Bahr el Ghazal. For a map showing the distribution of Dinka Tuich groups, see J. Ryle, 1982, Warriors of the White Nile: The Dinka , p. 25. This type of ornament was traditionally worn by men and women around their wrists after marriage. This particular example was made by the Jur, and is said to be over three generations old at the time of purchase. They are no longer made, and ivory ornaments are worn in their place. It is called malang. This term does not appear in Nebel’s Dinka-English dictionary, which gives the term for a brass bracelet as kièr, gur (Nebel 1979, Dinka-English, English-Dinka Dictionary p. 113); it may be a Jur word. Accession Book Entry [p. 185] - 1979.20 (.1 - 206) P[urchase] MISS PATTI LANGTON, DEPT. of ETHNOLOGY & PREHISTORY, OXFORD. Collection made by Patti Langton during the British Institute in East Africa's expedition to the Southern Sudan; Jan. - April 1979. The collection was made in three culture areas during the dry season. The amount paid for each object is listed if the information is known. In Jan. 1979 £1 is equivalent to 95 piastres (pt.) Sudanese. This documentation is based largely upon Patti's own list of objects and her notes on these. Sometimes objects included in the Pitt Rivers alottment of the collection do not appear on her list and have been added here. See Related Documents file as well. [p. 191] 1979.20.43-135 SOUTHERN SUDAN the DINKA TUICH. The Dinka Tuich, a pastoral people, live to the north of Wau, in Bahr el Ghazal province. This collection was made mostly at Dhangrial, the archaeological site at which we camped. Other artifacts were collected either at Wun Rog, a small town about a mile south of Dhangrial, or at Mayen, the new administrative centre 12 miles north. This was a remote area, difficult of access and rarely visited by outsiders. The Dinka are very aware of the potential of money, which is used either to help family members acquire education or entry into commerce and administration in Juba or Khartoum. Once it was known we (the collectors) were offering money, the Dinka in surrounding compounds came daily, increasing prices as often as they could! [p. 200] 1979.20.106 Brass wristlet, malang . Traditionally worn by men and women after marriage. This is one made by the Jur and said to be over three generations old. These are no longer produced; ivory ornaments are worn instead. Max. Diam. = 6.7 cm. ; W. = 2.2 cm. Coll. 25.2.79; 50 pt. Coll. no. 268. Additional Accession Book Entry [below accession number in red biro] - A5-F4-8. Sparks, Rachael. "Dinka Tuich bracelet" Southern Sudan Project (in development). 03 Jan. 2006. Pitt Rivers Museum. <http://southernsudan.prm.ox.ac.uk/details/1979.20.106/>.